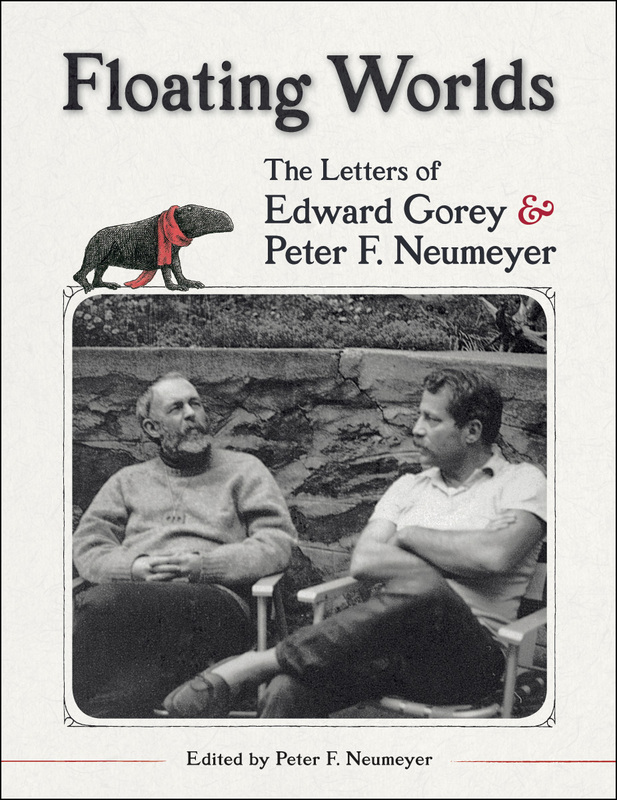 When a really nice person from Pomegranate sent me an email to inquire if I would be interested in reviewing any of their books and suggested perhaps Floating Worlds: The Letters of Edward Gorey and Peter F. Neumeyer I said, oh yes please! I have been a fan of Gorey’s very distinctive art for a long time. There is no one else quite like him and never will his work be mistaken for someone else’s or anyone else’s for his. I think his art inspires a loyal following. Many years ago when Bookman was a Barnes and Noble store manage one of his assistant managers invited us to her family’s annual Christmas party. The party was always held at her parents’ house, a large Victorian in St. Paul with room leading into room after room, stairs that went up and up, and peculiar nooks and crannies. It was a gorgeous house. This person’s father was a bit of an artist and a huge Gorey fan, so much of a fan that he had done up one of the rooms of the house in Gorey style. Not just the furnishings and decor, but he had actually taken to the walls with a black sharpie marker and drew Gorey characters all over it. Not just here and there, but they covered all four walls and the ceiling, crammed in and life-sized. It is the most amazing room I have ever seen. I am sure Gorey would have been both surprised and pleased by it. But in Floating Worlds we have Gorey the letter writer as well as Gorey the artist. The book is edited by Neumeyer, an academic and children’s book author. Gorey illustrated two of his books in the late 1960s and they became good friends. The letters in the book are from September 1968 to October 1969. Goery was 44 and pretty well established as an illustrator and author. Neumeyer was in his thirties with a young family and teaching literature at Harvard and then at Stony Brook. Their letters touch on many topics. There is much detail about the business of collaboration on their books, on art and on writing. But Gorey, who went by Ted, also proves to be extremely well read and is always telling Neumeyer to read this book or that book and sending him bookish care packages. Neumeyer, returns the favor of book recommendations and care packages. Gorey is also an avid movie-goer and writes frequently about the movies he has seen. And he loved the ballet. During ballet season he would typically attend as many as eight performances in a week. He liked to cook and was a believer in astrology. The letters begin not long after the two men meet and it is a real treat watching their friendship grow. They both are such nice fellows that I feel like I could plop myself down on Gorey’s sofa and listen to him babble all day. Likewise Neumeyer. Gorey’s letters are mostly typewritten with a few notes and postcards handwritten (oh he has such lovely handwriting!). Gorey had a great sense of humor, as one would expect, and he never crossed out and corrected anything in his letters only continued typing noting as he went that he probably spelled something wrong or realized what he just wrote made no sense. The thing is, and here we come to E. Gorey’s Great Simple Theory About Art (which he has never tried to communicate to anybody else until now, so prepare for Severe Bafflement), that on the surface they are so obviously those situations that it is very difficult to see that they really are about something else entirely. This is the theory, incidentally, that anything that is art, and it’s the way I tell, is presumably about some certain thing, but is really always about something else, and it’s no good having one without the other, because if you just have the something it is boring and if you just have the something else it’s irritating. Competence everywhere, and no real quality or sense of illustration except literal renditions of the text. I came to the sad conclusion that except for Ardizzone and Sendak, I am about the best around. A sad commentary on the state of things if ever there was one. If I do not seem to be mentioning anything I’ve read lately, it is because I am in one of those periods of undifferentiated flux or something in which I am reading about fifty, at a minimum, books at once, so of course I seldom finish one. Eventually this phase will pass, and I’ll discover I have about ten pages to go in all of them, and will sit down and systematically finish them, one after another. I completely relate to that last one and it made me love Gorey even more. In addition to the letters being an utter delight, the book is gorgeously produced. Thick, bright white glossy paper, so nice. And almost every letter Gorey wrote he would draw on the envelope. Many of the envelopes are included in full-color. Several of Gorey’s handwritten postcards are also reproduced as well as stories he wrote and included with the letters. Such a wonderful treat this book is, I wish there were more letters! If you are a Gorey fan, the book is a must. And if you know a Gorey fan, well, the holidays are just around the corner and will be here before we know it, what a good gift this book would make. The recipient would love you forever. Eight ballet performances a week! That’s dedicated. I love the idea of the drawings on those envelopes. What a treasure! Rebecca, I know, it’s crazy! I like the ballet but goodness, not that much. The envelopes are marvelous. Definitely a treasure. Does one ever throw away a personal letter? I doubt it. How many emails do people keep? Or texts? Or Tweets? I learned to text to my children, but I draw the line at tweeting (twittering?). Lovely post, Stefanie. I’ll have to check my library for this one, although it sounds as though it would be worth purchasing. And Gorey sounds like my idea of a great friend to have. Grad, I keep personal letters even when they don’t have fun drawings on the envelope 🙂 I do keep emails from people I regularly “correspond” with but I admit sometimes I forget and hit the delete key. Glad you enjoyed the review. The book is really a delight. What a great book–I am going to see if my library has a copy–I love Gorey’s illustrations (and I hope I’ve sent a few postcards of his work to you, too–I have a book of them…). That quote is great–a kindred soul if ever I saw one, and I can totally relate to that fifty book thing and getting close to finishing a few all at once–that happens to me all the time! Thanks for the heads up on this one! Danielle, I think you would really like the book. Yes, you have sent me a few Gorey postcards 🙂 I knew you would like the book quote. I can relate and I knew you could too! Got to get this book! What a lovely review, Stefanie. I love Gorey and have some of his books. Yes, this is a must for me. Thank you!!! He sounds like he has such a lovely sense of humour, too. Susan, thanks! Yes, if you love Goery, you will love this book. You really get a sense of who is was from these letters. He had a great sense of humor and just comes across as an all around genuinely nice person.